Expect a more formal launch at the end of May. AMD will close out its current microprocessor architecture this summer with “Bristol Ridge.” We got a sneak peek at the integrated APU running in HP’s Envy x360 laptop. John Taylor, AMD’s vice president of corporate marketing, said the Bristol Ridge series of chips will formally debut on May 31, at the Computex show in Taiwan. There, he said, consumers should expect a number of different related product announcements. “You can expect to hear more from all the global OEMs, as well as Microsoft,” Taylor said. That doesn’t necessarily imply that Microsoft will ship an AMD-powered device. AMD says its new 7th-generation APU, Bristol Ridge, will improve on its older processors and be competitive with what Intel has to offer, too. Why this matters: AMD has been largely relegated to the value space of notebooks, where it can emphasize lower power, as well as to desktops, where it seeks to carve out a niche with its integrated graphics technology. It remains to be seen how many OEMs will sign on to use AMD’s new APU, although this HP contract is a nice win for the chip maker. AMD helped launch the APU space five years ago (an Accelerated Processing Unit combines the CPU and graphics acceleration on a single chip), and this year is an important milestone. Until the chip’s launch, potential customers will have to be satisfied with just a taste of the new processor’s performance, which Taylor claimed would outperform Intel’s Core i7-6500U microprocessor in 3D graphics. All in all, Bristol Ridge should be about 40 percent faster than the Kaveri APU AMD shipped in 2014. 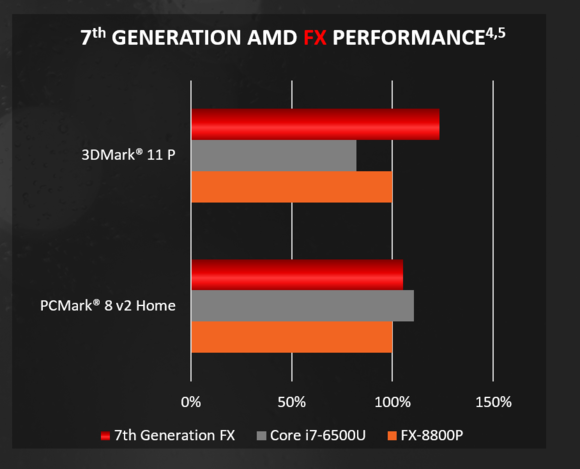 AMD's Bristol Ridge builds on its previous APUs. Note: due to a last-minute change, AMD is now claiming a 50 percent compute improvement. Bristol Ridge will contain four “Bulldozer” CPU cores, as well as up to eight GPU cores. Taylor didn’t reveal the clock speed of the chip being used inside the HP device. AMD will ship both quad-core and dual-core versions of Bristol Ridge, although Taylor didn’t specify which segments of the market would receive each. Eventually, AMD plans to ship both a desktop version of Bristol Ridge as well as a low-power, 15-watt version, Taylor said. “I would characterize the 15-watt [version] as the sweet spot of the Bristol Ridge design,” he said. Both Bristol Ridge and its predecessor, Carrizo, use the same 28nm process technology, but Taylor said Bristol Ridge features process improvements, including more efficient transistors and a technology called adaptive voltage frequency scaling. That’s resulted in a “significant uplift in clock speed,” Taylor said. By the end of the year, AMD will have moved on, to both its Zen CPU core as well as the Polaris graphics architecture, Taylor said. Clarification: AMD said it has revised Bristol Ridge's estimate of compute power relative to its Kaveri chip to a 50 percent improvement, not 40 percent.